If only she can resist his raw masculinity long enough to determine the cause of his unhappiness and the mansion’s neglect. She must find her answers quickly, before the worm-eaten floors fall from beneath her very feet. That is, if Harry doesn’t sweep her off them first.. 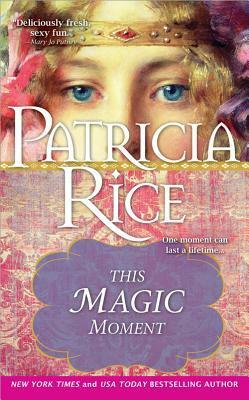 I bought this when Patricia Rice re-issued the Magic series as e-books, but it is about to be released in print soon, I thought this was a good time to review it. This is the fourth book in the Malcolm and Ives series, and it focus on Harry and Christina. I enjoyed following their romance, from a marriage of convenience to a marriage of love. They both mature a lot during the novel.Harry turns from an outgoing MP to a stern duke. His transformation is swift, overnight almost, but it makes sense. What I like is how he during the novel start to merge into a combination of his previous personality and his stern persona. Christina was bubbly, and slightly tomboyish when the book started. But slowly she becomes more lady like. The crumbling manor that Harry inherits felt believable, since a lot of nobles struggled with maintaining their estates. And Harry’s fathers wish to rebuild the manor was a part of that era. I liked the mix of old and new in the manor. The plot was well crafted, and filled with unexpected twists. I loved how Christina’s gift of seeing ghosts and auras got her into trouble. And I loved Harry’s reactions since they made so much sense. What I liked was that they realised that they had to work together to solve the mystery, and save the estate.